As part of a visualization I'm attempting to create, I was doing some experiments in processing. 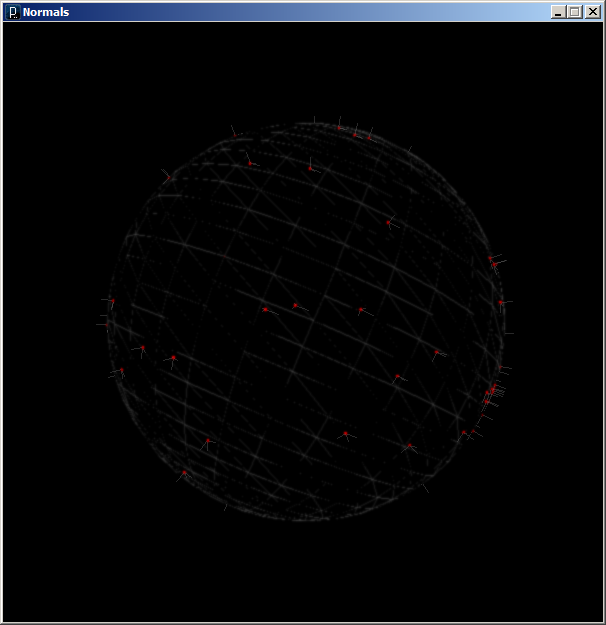 One of the experiments involved distributing points randomly on a sphere, and drawing the normal vectors for those points. Add in a trackball for rotating, panning, and zooming and it ended up being a pretty cool interactive toy by itself. I've been hoping to post the applet, but unsuccessful at getting it into blogger... so until I can do that, I'm just posting this screenshot instead. Hopefully, I'll be able to follow up with the applet itself soon. As a quick preview of what I'm trying to create - I want to be able to visualize simulated cluster communications as peers join, participate, leave, or drop out of a peer to peer network. In my mind, each peer will be one of those points on the sphere, with new peers popping up and peers disappearing or leaving from time to time. Their communications during network discovery and regular network usage will be represented visually by lines between the points. 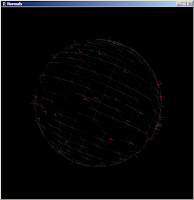 The interesting part will be when I can animate the networks over time and watch how different p2p algorithms appear. But I still have a fair amount of coding to get all that working.